Not to worry, guys. Our header image is working just fine! 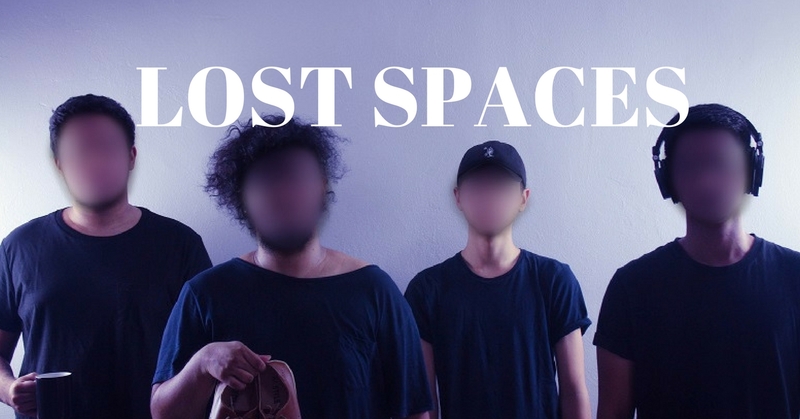 The blurred faces were intentionally done by Lost Spaces- an upcoming local indie-pop band whoaimed to keep the attention away from what meets the eye but more on the depths of the songs being played. Let’s get lost in the musical space and journey with Lost Spaces, shall we? Let’s go! 1. Hi Lost Spaces! Tell us more about yourself. We are a bunch of guys who were born in the 90s who happened to be literal family (well, almost all) and we love making music. We are lead by Sam Lopez who is on vocals and guitar, his brother Lukas Lopez on drums, cousin Imran Marshall on bass and close family friend Keane Chua on electric guitar. Our musical style mainly revolves around groovy indie pop with hints of ambient R&B. 2. How was your journey in music as Lost Spaces? Sam was actually doing the whole solo singer-songwriter thing on his own, playing acoustic shows most of the time while finding his sound as an artist. After playing with many different musicians, Sam finally found the sound and direction he wanted to go for and pitched the idea of starting a band with Lukas and Imran. We all thought it was a cool idea to run with it, so we recruited Keane. That’s when we officially started as a proper band somewhere in July or August of 2016. Since then, we’ve actively performed in shows in and around KL such as Merdekarya and The Bee, while slowly writing materials and creating our own sound. 3. Can you describe Lost Spaces’ music to us? From a sound perspective, we love playing very groovy yet ambient music. A mixture of sounds that make you feel deeply but will make you wanting to tap your feet or bob your head to the beat at the same time. We take a lot of influence from music from the 80s, with happy sad synth sounds, clean guitar hooks and line being our main emphasis. From a lyrical standpoint, Sam usually tries to give an honest commentary about life (even the saddest of days), but also always having optimism and hope to look forward to regardless how sad the tune may be. Currently we have yet to release any music online, but we are aiming to drop an EP sometime in March next year on Spotify and all major online platforms! 5. Tell us something unique about your band – something we wouldn’t know! We’re all crazy football fans, like Imran and Lukas are Man United fans, Sam is a Liverpool fan while Keane loves Arsenal to death. Our bonding time actually revolves around plenty of FIFA apart from rehearsing at home in our own makeshift studio. 6. Where would you like to see yourself in 2 years time? Touring the world! We know it is a big dream, but we feel in this space of time, it is the best era to make music. The internet has been a game changer for the music scene to allow access for music to be made from any corner of the world, so we believe with the right marketing and a focused direction, the sky is the limit for any band, really. We’re just going to work smart and hard and see where this journey takes us. 7. Are there any upcoming projects we should look forward to? We’ve got two shows coming up before the end of the year, on the 25th of November 2017 we are curating a show with our friends at Lucid Loft called Communion, which will feature bands like The Soundtrack, The Peachskins and our good pals from Singapore, Bakers in Space. The show starts at 8.30pm and we’re be the first band to perform! Also, on the 2nd of December 2017, we are playing at Kingdomcity KL’s Christmas show- The Sound Unite: Christmas alongside Paperplane Pursuit. So do come see us in action! As mentioned earlier, we’re also working on our debut EP, which will be dropped in March next year. Look out for a single and MV early next year! So do look out for it. 8. Any last words for our readers? We’ve been working on our music for quite some time now and we can’t wait to share them with the world! Don’t forget to check them out on their Instagram, Facebook, Tumblr and Soundcloud!